Cozy Sundays are special days to me that fill my heart with gratitude for the little things; they are that delicate seasoning that gets sprinkled into a week like fresh thyme gets sprinkled onto roasted garlic turkey breast, offering up a rare and elevating flavor, and much needed coziness and comfort. This was a very good weekend, indeed. It was a weekend that was the perfect mix of play and work; but the type of wonderful work that can actually feel more like play, the type of work that requires some soul-mining and lots of courage and the taking of first steps towards new endeavors that will soon be shared here. And that exhilarates me and makes me feel quite alive, and warms my heart with gratitude. It’s been the type of weekend that is full of creativity, of trying new things, of lots of amazing and rich conversation, lots of passion, and the perfect kind of rest that leaves me actually feeling quite ready to venture into Monday, and not have it be quite so blue. And on top of it already being a perfectly lovely weekend in general, I find myself writing on a rare gray Sunday—the type of cool, breezy, thick-with-clouds fall Sunday that I utterly adore and want nothing more than to wrap myself up in; and the kind that feels a little dreamy and ethereal, that allows me to get lost in fuzzy daydreams and participating in activities that are more child-like than adult. And that is so needed for my soul—it’s what I crave so desperately at the moment. Cozy Sundays are for me the precious seasoning that gets sprinkled into the kettle that sits bubbling away on the stove that is everyday life, giving the contents a deeper flavor and that certain something special and magical. They are the delicate threads of saffron in a pot of fragrant basmati rice, or the tiny little green leaves of thyme and the savory-sweet addition of roasted garlic that deliciously season and flavor a festive, holiday turkey breast, taking it from pleasurable to scrumptious. Wrapping myself up in this blanket that is a cozy Sunday after a weekend that has felt like a wonderful, warm cocoon gives me a sense of peace, a sense that all is well, and that these hopes and dreams that fill me to the brim are possible. It reminds me how good it feels to take the pace of my life down a few notches, and of how exquisite it feels to just enjoy a cup of mint green tea while writing, with the scent of diffused lavender filling the room, and just allow for feelings and realizations to wash over me at their leisure. And these are the little things in life, the details found in the nooks and crannies, that give it all of its color and flavor. Grateful to be able to take a little piece of its merciful comfort with me into my week, and to enjoy its lingering flavor as I now enter back into the thick of life, and into what awaits me in the upcoming week. -Preheat the oven to 400°. -Drizzle a little oil over the cut head(s) of garlic, plus a sprinkle of salt and pepper, and wrap each of them tightly in a square of foil. 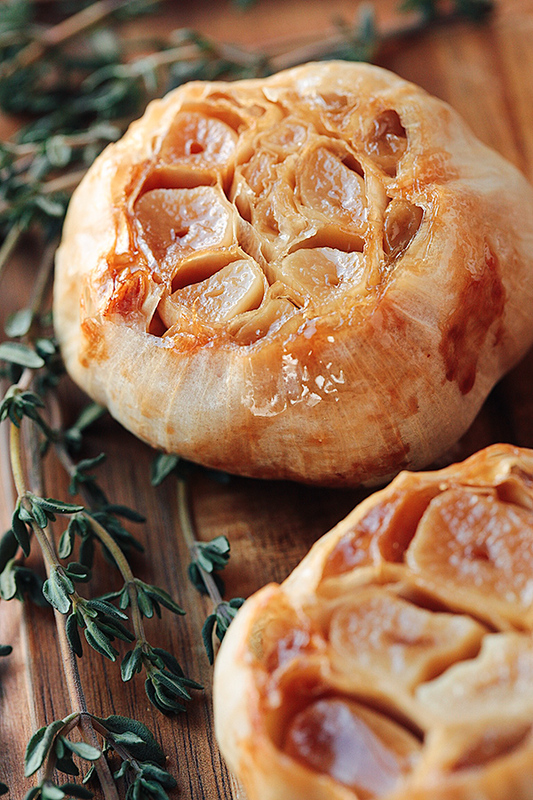 -Roast for 45 minutes, until soft and golden-brown; allow to cool, and once the garlic can be handled, squeeze the roasted cloves from their papers, and mush into a paste using a knife or fork; reduce the oven temp to 375°. -Add the roasted garlic “paste” into a small dish, along with the softened butter, and blend the two together completely, along with a pinch of salt and pepper, as well. -Place your turkey breast on a work surface, and gently place your fingers between the flesh and the skin, carefully pulling it apart, and add the garlic-butter underneath the skin, over the meat, spreading it liberally; reserve about 1 teaspoon of the garlic butter, and rub it over the skin, as well. -Next, to a small ramekin add ½ teaspoon of salt, ½ teaspoon of black pepper, the Italian seasoning and the paprika, and combine this seasoning mixture; sprinkle it all over the top of the turkey (over the skin). -Place a digital thermometer into the thickest part of the breast, then place the breast onto a baking sheet lined with foil, and roast for about 1 hour and 15-20 minutes, or until the thermometer registers 165° (the temp is more accurate and important than the time). 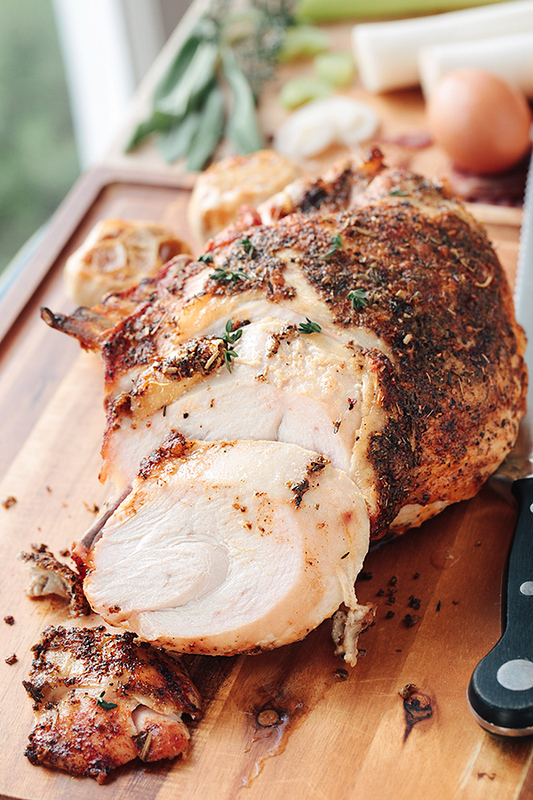 -Allow the turkey breast to rest for about 10 minutes before slicing the meat; sprinkle over the thyme, and serve. This was by far the best turkey breast I’ve ever made! 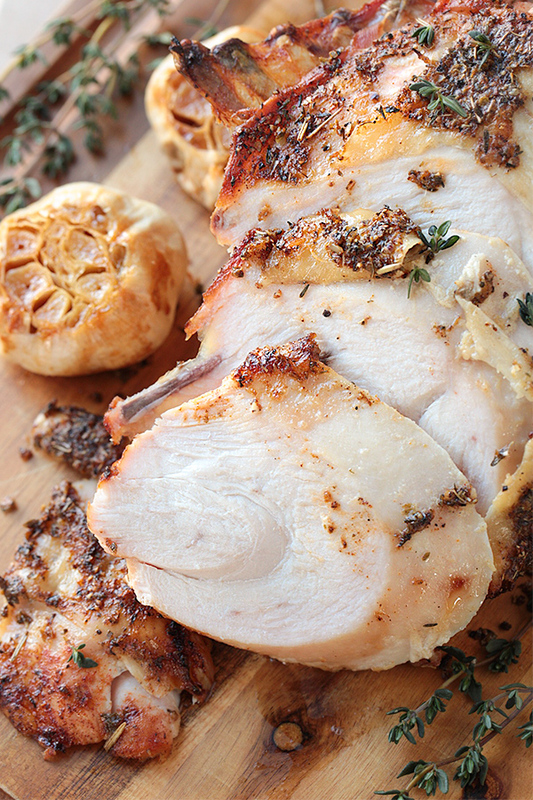 I’ve always thought a turkey breast was s great healthy option, but previous attempts were dry and boring. 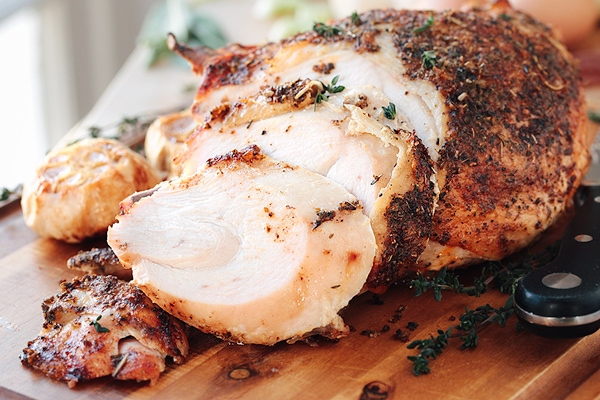 This recipe takes a lean meat and makes it succulent & delicious. Thanks! I’m making this now. I did a little different seasoning. Only because I was going to cook it yesterday in my slow cooker, prepared it with a rub & then realized it wasn’t going to fit into the pot so the lid wouldn’t go on. So I wrapped it up good & tried this today! It smells so amazing in here & it’s only been in for less than 45 minutes. Sounds amazing! I am considering making this for thanksgiving instead of a full turkey. We are having 15 People, how many Breast would you recommend? Hi Tiffini, I’m excited you’re considering preparing this recipe! I would use about 4 turkey breasts at about that 2 1/2 – 3 pound size; I have this recipe serving 4, so if you multiply it by 4 that would serve roughly 16. 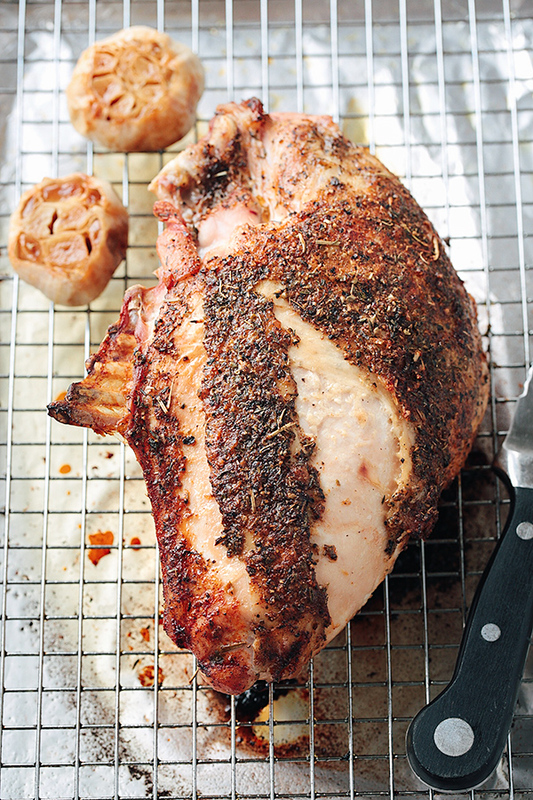 Do you roast turkey breast, covered with tinfoil or uncovered? Hi Sandra, I roast it uncovered for crispy skin.